Deciding whether you should buy a wired or wireless mouse used to be a passionate debate among computer users, but the gap between the two peripherals has become narrower over the years. There are pros and cons for both the cordless mouse and the wired mouse, but the priority you place on each depends on the kind of user you are. Gaming mice have particular features suitable for gamers, and your average internet surfer can deal with a normal mouse without any problems. Both types of computer mice usually support many of the same features, but some core differences set them apart. Someone might choose a wired mouse over a wireless mouse because, well, it's not wireless. Wireless devices are, by default, a tad bit slower than wired devices since they need to transmit information wirelessly. This little bit of lag is especially important for gamers. A gamer might choose a wired gaming mouse over a cordless mouse because wired devices don't present as many delays as wireless ones, and that's extremely important when precision is key. Plus, nearby interference can make the mouse movements choppy or even completely kill the mouse until it's corrected, and that's the last thing anyone wants to happen (especially a gamer). However, interference is generally not a problem for most people as long as there aren't obstructions between the mouse and its receiver. Wired is cheaper. Although the prices of wireless mice have plummeted over the years, the fact remains that wired computer mice are still less expensive than wireless ones. No batteries needed. You're never left searching for batteries when your mouse is powered by your computer, which is another reason wired mice are cheaper (you don't need to buy batteries). Some wireless mouse manufacturers try to circumvent this issue by using a docking station, but it, in turn, takes up valuable desk real estate. A wireless mouse is definitely more convenient than a wired mouse. You can get a pretty small portable wireless mouse, and you have no cables to worry out that can get tangled up in your bag or drag things around your desk as you use it. This makes them especially nice for traveling, too. Just like with all wireless devices, you have the added benefit of using it away from the receiving device. A wired mouse is tethered to the computer and can only work if you're within reach, but a cordless mouse can be used from across the room. You might choose a wireless mouse if you use your TV as your monitor and want to control it from your couch. Maybe you like to use a mouse with your tablet but it doesn't have any USB ports. Or maybe your computer sits too far from your keyboard and mouse area, like under your desk and against the wall, and a cordless mouse is your only realistic option. Some people might turn down a wireless mouse in favor of a wired one because they've lost their receiver and the mouse no longer works. However, some companies have developed computer mice to solve this problem, ones that include placeholders on the device to hold the receiver and prevent it from being lost. Versatility. Logitech's Unifying technology is one example where the mouse can open your other USB ports by pairing several devices to the same USB receiver. Of course, this means you need to purchase Logitech devices for all your peripheral needs, but it's something to consider if you're sick of swapping receivers. What's more is that a wireless mouse seems more appropriate to unplug and move between computers if you need to use the same mouse on your laptop and your desktop, for example. Wired mice aren't as easy to unplug and unravel to move. Aesthetics: This maybe shouldn't be your only reason to get a wireless mouse, but it does make sense that a wireless keyboard and mouse combo on a minimalist desk just looks a lot better than having wires everywhere. Which Mouse Is the Best? Even after deciding to get a corded mouse or wireless mouse, you need to pick one among the hundreds that are out there. Wireless mice: We keep a list of the top wireless mice you should buy if you're looking to take advantage of all that a cordless mouse has to offer. There are also some relatively cheap wireless mice you can get. 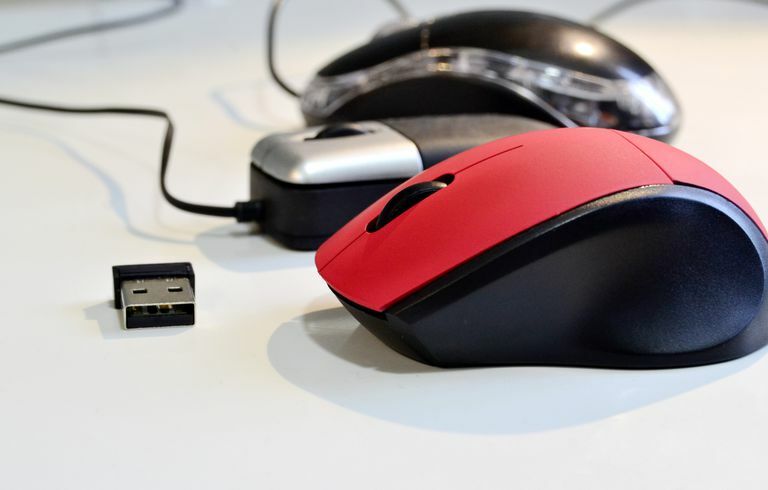 Gaming mice: See our hand-picked list of the best gaming mice if you're a gamer in need of a new mouse. In that list are both wired gaming mice and wireless gaming mice. Travel mice: Depending on your needs, you might want a compact mouse you can take with you that's easy to put away but just as easy to use when you need it. See this list of the best travel mice for some of our favorites.